The credibility of our Service Department is absolutely astounding. Specializing in stock and high Adventurer, Aliner, EverGreen, Forest River, Lance, Little Guy, Livin Lite, Northwood, Palomino, Travel Lite. we are equipped to make your truck camper, folding trailer, teardrops, travel trailers, toy haulers, suitable for you and your taste. We have top factory-trained technicians on duty during all business hours. We honor all warranty work and favor any recalls. 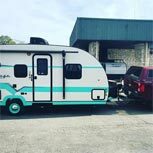 We accommodate any type of problem that may arise with your truck camper, folding camper, tear drop, travel trailer and toy hauler in an efficient, precise, and timely manner. Looking for a repair, a part, an upgrade, or a way to customize your camping experience? Princess Craft has the gadgets and gizmos you need to keep your adventures running smoothly. Even better, our trained and certified technicians can take care of the work and get you on the road without any hassle. Our factory trained technicians are among the best in the industry. We take pride in keeping your RV in tip-top condition. We service all types of RVs including motorhomes, trailers, pop ups and truck campers. Maintaining your new or used truck camper or travel trailer purchase is stress-free with an Extended Service Protection plan by Preferred RV. Appliances, generators, awning, satellites, electronics… all covered for up to 7 years, depending on the plan. In addition, Preferred RV has a concierge service to help with travel plans, emergency arrangements, directions, and much more. Preferred RV is endorsed by RVDA and accepted at most repair facilities around the country. Here at Princess Craft, all service work done under the Preferred RV Protection Plan is at no charge…We pay your deductible! Take the worry out of RV repairs with an Extended Service Protection Plan from Xtra-Ride.